We are giving new lives to people who are escaping Venezuela. My name is Guido Núñez-Mujica. I am a Venezuelan biologist, from Mérida a college town in the Andes Mountains, but these days I work as a data scientist . Over the past decade, I saw first-hand how corruption and social unrest left Venezuela impoverished, violent, and unstable. Today, jobs have disappeared, hyperinflation has pushed over 80 percent of households into poverty , and starvation has consumed the lives of tens of thousands of innocent children . An average Venezuelan college professor now makes a meager $0.33 a day; the international standard for poverty is $2. I changed careers so I could help not only my friends and family, but also anyone else who needs it using my salary. Last year I helped 22 people leave Venezuela and rebuild their lives in 7 countries. They included academics, designers, engineers, and more. They came from all walks of life and regions of the country. But this is not about me. The Salto Project arose from a common desire to help the world’s least fortunate. Our team is one of entrepreneurs, academics, consultants, and other successful professionals from all walks of life. From Yale-educated nonprofit founders to Venezuelan biologists, we are committed to laying the groundwork to rebuild the fabric of Venezuelan society in the future. Salto provides micro-sponsorships that help individuals leave Venezuela and rebuild their lives abroad. 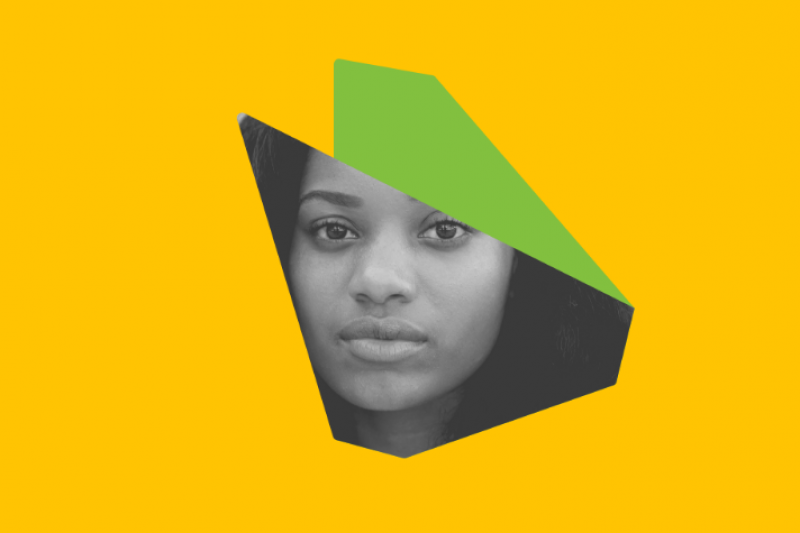 Our sponsorships take many forms: funding to cover transit out of the country, temporary housing in new destinations, connections to find jobs, immigration lawyer referrals, psychological assistance, and more. Our process is highly personalized – we spend many hours designing and executing an exit strategy for every person. This year, our goal is to help at least 52 people -- one per week -- as well as formalize an outreach program that amplifies our footprint in Venezuela and helps us open new locations in other countries. We cannot do this alone – please help us assist generations of trapped Venezuelans by contributing to our campaign. We will provide regular updates on our efforts to our supporters. We hope this campaign will be the start of something even greater – an initial funding round that helps us grow and touch the lives of thousands more Venezuelans in the years to come. Interested in corporate sponsorships or non-financial assistance? Please contact us at operations@saltoproject.org FAQ What is your relationship or contact to the parties you're raising funds for. Most of the people we help contact us using our website, we have no previous relationship to them. Some others are my relatives and friends. How the funds will be spent (be specific as possible) The funds will pay for the rent of an apartment in Santiago where we temporarily house Venezuelan immigrants and for bus tickets and plane tickets from the border with Colombia to different destinations. We do not send money directly to Venezuela. In order to send the money we use wire transfer services like Western Union or RIA. Your withdrawal plan to get the funds from the campaign to the ultimate beneficiary Transfers via WU or RIA to Cúcuta or Maicao, or sending emergency funds to whoever needs it. In February, we got a plane ticket for Juan Carlos to get to Madrid, via Turkey. 20 hours of travel for a new life. 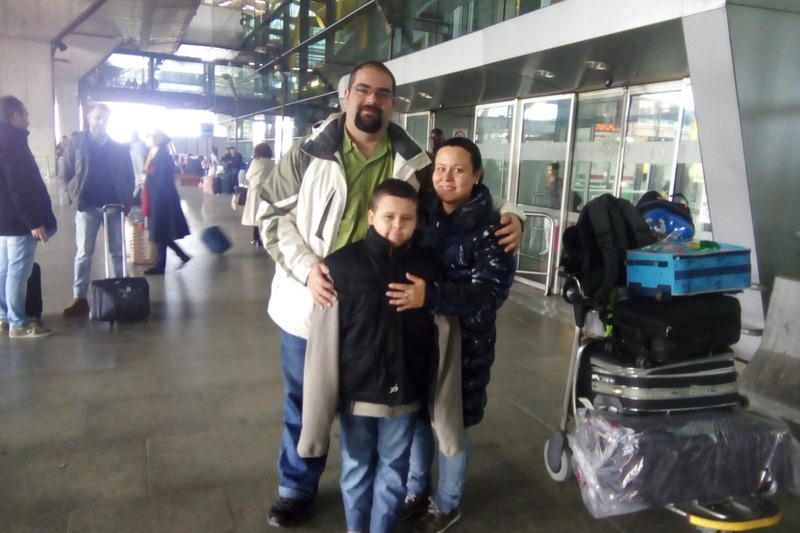 He arrived in May, and immediately he got a job and started working, and now, he was able to get his family out! No further help from us. Lucymar is a nurse and she will make a huge contribution to her new country. Their kid will have a better life, and Juan Carlos is now a very happy man. This is huge for me and for Salto. Our first family reunited in Europe. This is exactly what we envisioned when we started Salto, that'd we'd give initial help and then the cycle would self sustain. And that has indeed been the case and this is a great example. Every day we keep doing our best to continue helping, and even if it will never be enough, it makes a life changing difference for those we can help. 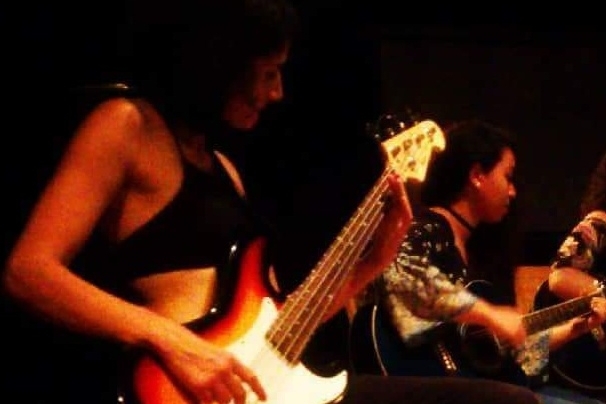 Delly is a bass player, and now from Mérida she Leaped to Bogotá. She's my friend from many years ago, a tough, but kind woman that is creative and hard working. She has now the opportunity of a better life in a functional country where she can be free to love her girlfriend and keep doing art and amazing projects. Salto made a difference. Soon, her sister will follow her steps. Salto changes lives. Thanks for your support, for your help to enable Delly and others, to empower them and give them a new beginning. Please share this with your friends and family, we need more donations. My fiend L., who went to Santiago last year was helped by Salto with a tiny amount for getting settled. She got her documents, she got a job at a sandwich shop, she was doing well (much, much better than in Venezuela working at the University), but of course she could do a lot more. L. and I went to school together, she's a biologist as well. Well, during my visit I introduced her to one of my good Santiago friends who has a biotech company. She was interviewed and she got a job. L. is happier now, as she will be working in a lab again, her salary almost doubled and she was smiling. We talked on the phone yesterday, and I was smiling so much. This is exactly what Salto is about. About improving lives, about fulfilling needs, about making sure that the talents of the immigrants are put to productive use. It's not only about money and bus tickets, it's about enabling people and creating networks for those who just arrived to a new country. Thank you so much for believing in us, in these people, for giving them a chance. You are making this a etter world. First, thanks to our donors for their amazing generosity. We are overwhelmed and happy with the way our campaign is going. I have been in Santiago, Chile, for nearly a month. I have been meeting my old friends, my family who is now here, and some new friends, the people who we have helped with Salto and who I had never met before. 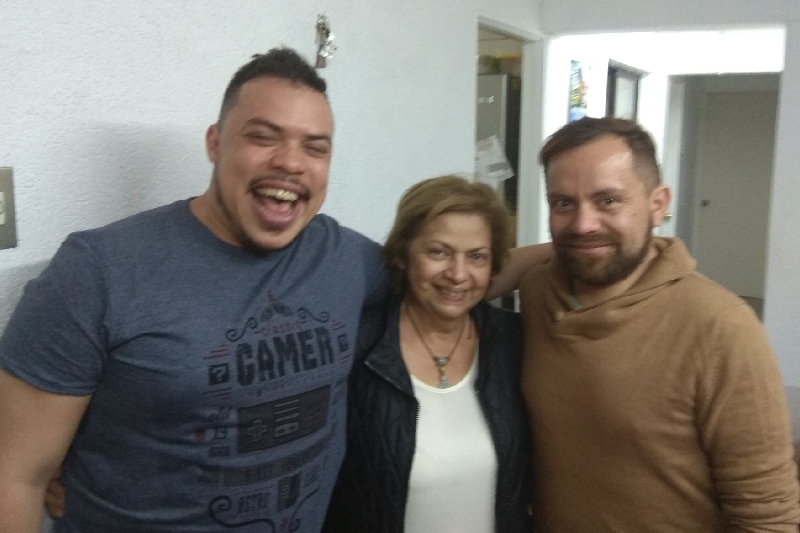 I have been working side by side with my business partner, Gerardo Barrera, who is helping us with Salto as well, and my aunt Zaidee Núñez, who has been taking care of the apartment in Santiago. We have decided that we can expand to a larger house in a different area of Santiago and help more people with the same budget. The apartment where we are now located will still be harboring Salto alumni, but from next month they will be paying for the rent of the apartment. We are excited because we will be able to do more with the same resources, and we are extremely grateful to all of you for your help. We also are incorporating Salto as a Chilean NGO and once we have corporate personhood, it will be easier to support people as they move out of their initial living situation with us. We can legally help them to rent another place and connect them with other resources for job finding, help them better with paperwork for immigration. This trip has been hectic for me. I am still working remotely for my company, I was finally able to see my husband again. Now Santiago is very different to how it was years ago, and so many faces from my past are now here. I have had to answer interviews and work on Salto issues (and I am still way behind answering emails). But even if I am tired, I am happy because I have felt supported and loved for so many generous human beings, because things are moving forward and even if the tragedy deepens back in Venezuela (Now the Maduro government banned Copa, one of the last working airlines in Venezuela), the hope just keeps growing here and in man other places. We keep leaping and we keep living.